For more than a decade, Davidoff seems to have been looking to add a full-bodied cigar to the Davidoff line. Known for its classic, complex, balanced cigars that tend toward the milder end of the spectrum, various additions over the years have been aimed at consumers who appreciate Davidoff but want a fuller-bodied cigar. This year, another bolder Davidoff offering was introduced: the 702 Series. For the line, the the company took seven popular White Label vitolas and swapped out the traditional Connecticut wrapper for an Ecuadorian-grown Habano. The deep brown wrapper was originally featured on a limited edition 2009 Toro Especial cigar and was created by Davidoff as a hybrid of three Cuban seeds. The binder and filler for each of the seven 702 cigars is the same as the non-702 version. I smoked three of the 2000 size (5.1 x 43). The cigar features an Ecuadorian binder and Dominican filler. The suggested retail price is $15.80. The cigar starts out with a burst of caramel and cinnamon sweetness, but soon settles into a more traditional combination of roasted nuttiness, café au lait, and warm, well-aged tobacco. With a perfect draw, solid ash, and even burn, the cigar delivers medium-bodied flavors from start to finish. With the exception of occasional black pepper there isn’t much spice, though towards the final third leather and biscotti flavors emerge. As mentioned above, Davidoff’s challenge has always been staying true to what makes Davidoff so appreciated as it caters to consumers whose tastes tend toward fuller-bodied flavors. By bifurcating its Black Label and White Label lines, Davidoff has finally settled on a successful formula. The addition of the 702 Series adds a new twist, but ultimately fits into the White Label line as a medium-bodied cigar that is subtly complex and exquisitely balanced. 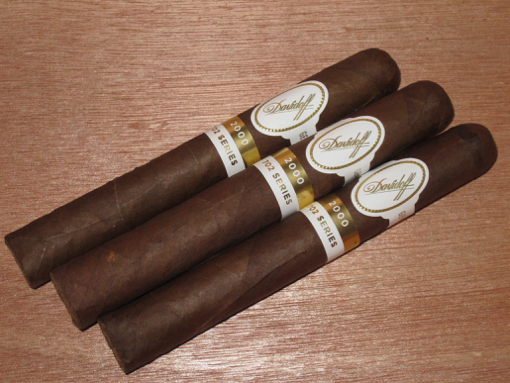 Davidoff cigars are always priced as premium cigars but they usually deliver, and the 702 Series 2000 is no exception, which is why it earns a rating of four and a half stogies out of five.